With all the coverage of the events commemorating the terrible happenings on 9/11 something became painfully obvious to me. Before I share what it was I will admit to being one of "them there foreigners" and so my view is from the perspective of one who has only lived here 9 years but who has always loved the USA. I guess I am a little unique - many Americans claim Irish roots while I am an Irish man who has American roots - my mother's parents met and married in New York and all her siblings were born here. What became evident to me (I would believe many others also) is the stark contrast between the US in the days after 9/11 in 2001 and now 10 years later. 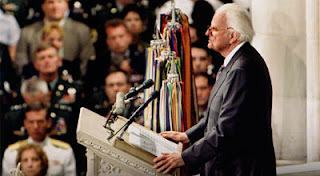 10 years ago we had a Christian statesman Billy Graham give a message outlining our need, as a nation, of God. He said, "we desperately need spiritual renewal....my prayer is that we will feel the loving arms of God wrapped around us." We had scripture reading and prayer in the name of Jesus. Our president said that these events "lead us to pray....prayers that yield our will to a will greater than ours.....may He always guide our country." Today the same event was held excluding evangelicals and certainly was a far cry from the messages we heard 10 years ago. It was more of a muddle of syncretism and political correctness. 10 years ago the solution in 2001 was to turn to God and today it seems to be "if we can come together." Difficult for God to wrap His arms around a people who distance themselves from Him. In regards to the New York service Mayor Bloomberg stated, "what religion would we chose anyway?" A strange question for a leader in country which states in their pledge, "under God," a God who the founding fathers had no doubt as to His identity. 10 years ago this country was united in an unprecedented way - Americans stood shoulder to shoulder hand in hand. I remember visiting 6 months afterwards and still every house, every yard had at least one flag flying. Today this country is as divided as it has been in decades. 10 years ago people flocked to churches with a new understanding of their deep need of the Judeo Christian God and a desire to feel his comforting touch. Church attendance immediately increased by 25% that Sunday. The following week, half of American adults attended a church somewhere. Today many churches are far below pre-9/11 numbers. Surveys show us that there seems to be more acceptance of other ways and sources of peace and God has been downgraded to one among many. 10 years ago our president called out on our behalf to Almighty God and challenged us to do the same. Today our president deems national prayer unconstitutional. We have come a long way......in the wrong direction. God gives us a simple solution. If we would humble ourselves, pray, and turn from our wicked ways He would heal our land. Could it be that the pain that we are feeling as a nation today is somehow linked to our unwillingness to do these three things. 9/11/2001 humbled us and caused us to pray like never before. I fear that we we have not simply become passive in this regard but have taken clear steps to move in the opposite direction of doing these things. May God have mercy on us and turn the hearts of this nation once again to Him. May we personally learn the lesson of how easy it is for us as individuals to also slip and forget some of the foundational principles of our faith. "The dismissal tells a story. It is more than a signal that the time of worship is over. 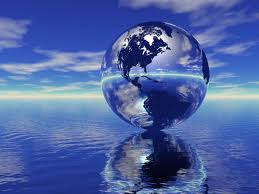 It is the beginning of service in the world. The content of the Dismissal, although brief, should be well thought through. . . . [We] need to give careful thought to the words and actions that send God's people into the world." Robert Webber, Worship Is a Verb: Celebrating God's Mighty Deeds of Salvation (Peabody, MA: Hendrickson Publishing, 1992), 102-103. One of the great things about doing the Master's Course on Worship Studies at IWS in Jacksonville, Florida, was that it really helped me to see things from a different perspective. For example, looking at the "Four-Fold" pattern of worship that seems to have permeated the life of congregations from very early on, until even now in our more liturgical expressions. Entering in to God's presence, or even being reminded of Jesus entry into this world, however you look at it, we "enter" intentionally into meetings, seasons, and experiences that are designed to make us more keenly aware of God's presence. The same goes for the ministry of the Word, The Table, and of course, the Dismissal. 2) Why does this incredibly important aspect of worship need to be brief? The emphasis on service (Romans 12:1&2) is so important to how we live - daily - in an extremely complex world. Making direct application, and moving from propositional truth to incarnation truth is so imperative in today's postmodern world, not only for relevance sake, but also for our own - we really do need to keep it real. And an exhortation to really consider how we can, as is said in Hebrews 10, "Stimulate one-anther to love and good works" is so necessary in an environment today that is so fed up with talk, and really wants to see reality in people's actions. How might our congregations meetings look if we took one Sunday a month and emphasized this all too often passed over critical element in the life of a congregation's worship? True Beauty is at the core of God's self-disclosure. not to mention nails, thorns, and blood?